ScreenSteps Desktop 2.9 and Workgroup DocumentationScreenSteps Desktop & WorkgroupScreenSteps 2.9 TagsHow do I delete all instances of a tag from my library? Make sure you are in Tags mode (1) and select the tag you want to delete (2). Press delete on your keyboard and click Delete on the dialog box to confirm. The tag will be removed from your library. 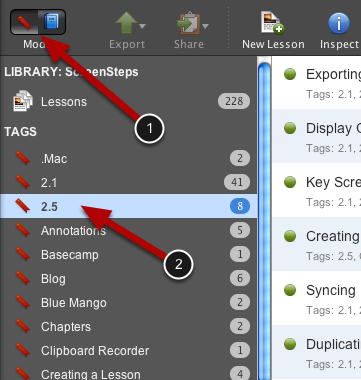 Prev: How do I delete tags from a lesson?